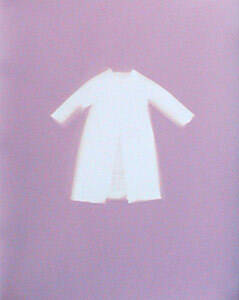 Yossi Milo Gallery is proud to present “Boys & Girls,” an exhibition of brilliantly colored photograms by F & D Cartier. The exhibition opens on December 5 and closes on January 11, 2003, with a reception for the artists on Thursday, December 5 from 6:00-8:30. A husband-and-wife team, F & D Cartier worked independently as artists for many years before fusing their careers in 1998. FranÁoise was a painter and sculptor, and Daniel focused on black-and-white photography (winning the Swiss Federal Grant of Applied Arts in 1977 and 1980). “Boys & Girls” consists of photograms, which involve a camaraless technique. F & D Cartier create images by placing objects—vintage Barbie dresses in the “Girls” series and handkerchiefs in the “Boys” series—on photographic paper and exposing the paper to natural light. F & D Cartier process the paper (akin to the method that William Henry Fox Talbot used in the 1830s in his “photogenic drawings”) to achieve a pink coloration on black-and-white paper, which characterizes the Cartiers' work. Thus, the pink photograms are actually gelatin silver prints. F & D Cartier's photograms—including images from this show—were awarded the Acquisition Prize from the Swiss Foundation of Photography in Zurich. Images from this show will also be included in two upcoming solo exhibitions, the first at the Photoforum Bienne Switzerland in March 2003, and the second at the Houston Center for Photography in 2003-04. F & D Cartier's work is in numerous public and private collections in Europe, South America, and the U.S., including the MusÈe de l'EysÈe in Lausanne, Swiss Foundation of Photography in Zurich, Museet for Fotokunst (Museum for Photographic Arts) in Denmark, Bibliotheque Nationale de France in Paris, and Fotografie Forum International in Frankfurt. FranÁoise and Daniel Cartier reside in Switzerland. This exhibition will be F & D Cartier's first solo show in New York.